Dr. Lynne Kenney shares with us why having dinner together as a family is so important, as well as some great tips and tools to make planning these meals much easier! Here is her original post on her site. 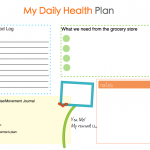 We encourage your family to share in a similar meal, but if you have children with special dietary needs, here is a simple printable for helpful meal planning. CLICK ON IMAGE TO ENLARGE AND PRINT. Summer can be a great time to teach kids about the value of a dollar. Math and money skills, creativity, and even marketing can be taught with these kid-friendly summer jobs. Self-esteem and confidence comes from feeling independent and learning the importance of earning and saving can never be taught too early. Each week we will share our #StressLessSummer tips and share other top experts including Dr.Lynne Kenny and Wendy Young, authors of Bloom to make this the happiest and healthiest summer yet! Even at a young age (with some adult supervision) helping out a neighbor who has their hands full or is going on vacation can be a money maker for kids. From watering their plants, mowing lawns, dog walking, pet sitting, or even babysitting, kids can cash in. Help them make posters, depending on their interests and ideas, after they create it, you can help through email or phone calls. Have them do the initial “marketing” and ideas so that they are invested. 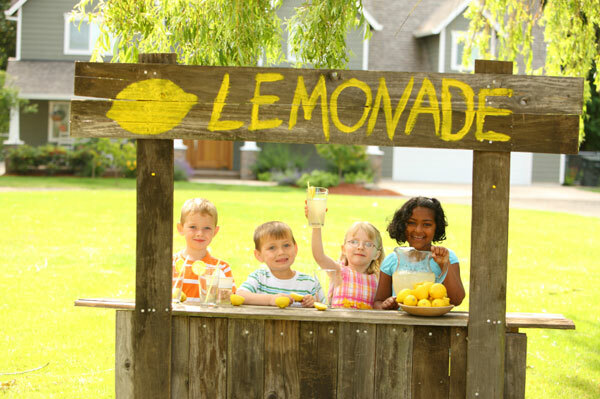 The idea of a simple lemonade stand can be a math and marketing lesson. Kids can research; what’s the best time of day for getting the most customers? Where is best location? What will be refreshing? How much will we need to spend on supplies? Get creative, how can they make their stand unique, instead of classic Kool-Aid, maybe slices of watermelon or Popsicle. The summer options are endless. Not all chores are part of a child’s allowance or family duties. Sometimes the extra work can pay off, literally. Running an errand on their bike, washing the car, ironing shirts, or taking care sibling, can teach responsibility and build self-esteem. If the idea of a garage sale is maddening, you are not alone, which is why there are so many resale and consignment stores and e-stores for kids these days. Help them go through their old toys and clothes, picking out things they don’t play with or fit into. Kids (and adults) can earn money on the spot. Here are some valuable ideas from experts around the world to help you bring the summer fun to your home. Recently, we were on holiday as a family and I found it so easy to exercise and eat well every day. We were on relaxation speed. But when we got home it was back to chasing horses at 7 am, writing til noon, phone calls, radio shows etc. Whoa! Where did all that health fly to? 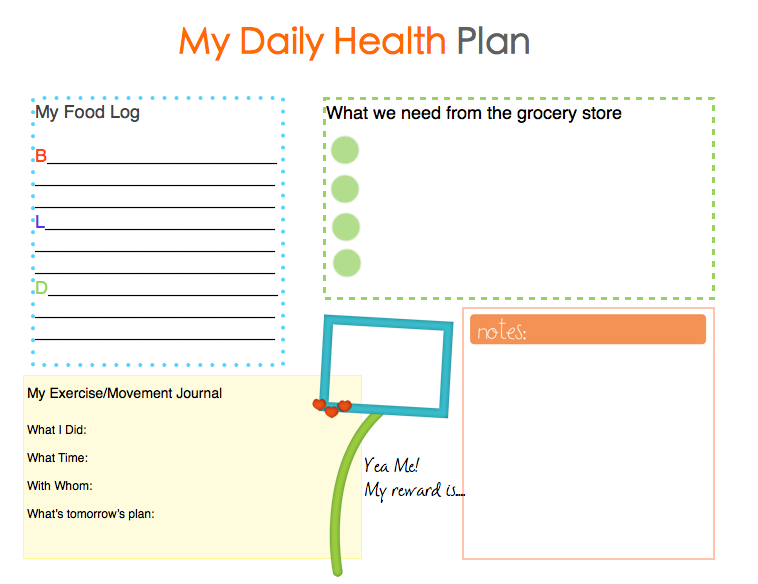 So yesterday I made a little daily health sheet for our fridge to bring fitness front-of-mind. I thought you all might enjoy it as well. 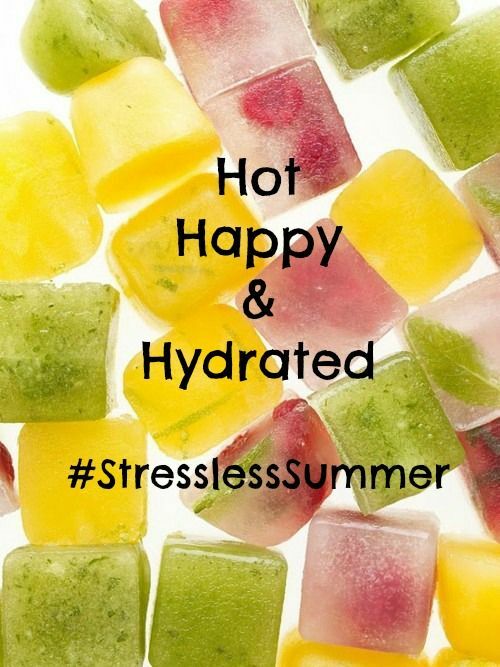 Wendy Young @kidlutions, I and all our colleagues on the #StresslessSummer series ~ @TheSpicyRD, @HAPPYsuperfoods, Sue Atkins @sueatkins, Naomi Richards @thekidscoach, Emily Roberts @EmilyRobertsLPC, Maria Freeman @littlejots, Deb McNelis @braininsights, Victoria @HMMilitary, Jan Katzen @nutritionistjan, Kelly Cairns @kellycairns and more wish you a happy, healthy summer! We love being a part oft the #StressLessSummer Series with Dr .Lynne Kenney and Wendy Young authors of Bloom! Brain Based Parenting. 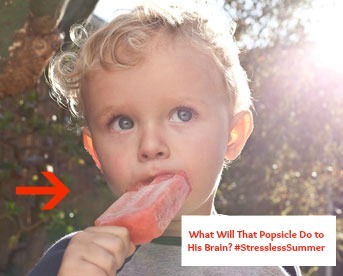 This week we are focusing the effects of summer foods on the brain, and it’s contribution to behaviors. 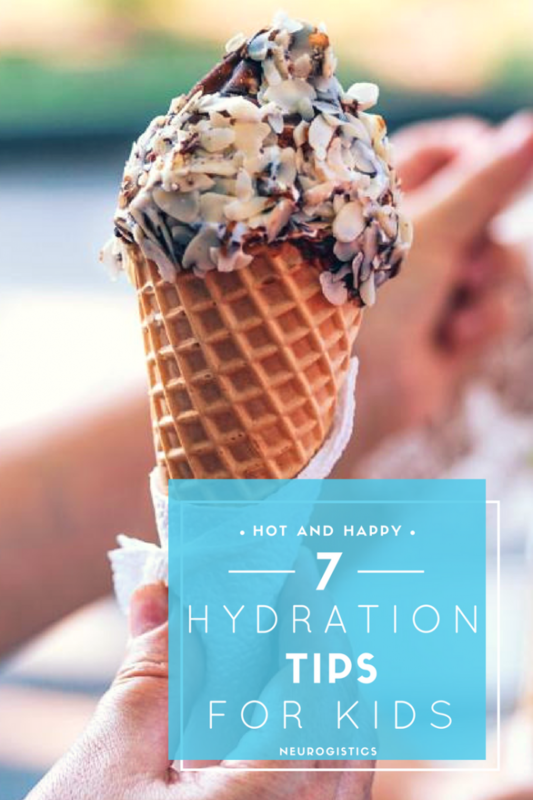 Here are some tips to make your frozen treats better for your brain. The summer heat can tempt us to reach for a cool treat, but beware of what lies beneath the wrapper. Even bars that are all natural and 100% fruit can cause tremendous changes to the brain and your child’s behavior. The brain responds to the sugar overhaul by spiking blood sugar and excitatory neurotransmitters temporarily, leading to a behavioral “crash and burn.” Scientifically speaking, even after the first bite, our brain releases a surge of insulin. Often the pancreas is tired of doing this and it will ask the adrenals to help because a “load” of sugar has hit the body and it needs to be handled. This does cause an excitatory response in children, leading to behavioral bursts. If it is matched with a protein, the effect will be lessened Plain fruit without some protein to keep the sugar spikes at bay, can feel a pound of sugar to your little ones brain. Store bought brands may be all fruit but lack the protein. Homemade, brain-friendly, bars are simple and so much better for you. Get creative and enlist your little one to help test out new recipes. Ziplock now makes Zipzicles, bags to that make homemade popsicles portable! Freeze your favorite Greek yogurt and fresh fruit or preserves, yogurt not only contains a ton of protein but probiotics for maintain a healthy gut. Want to go dairy-free, no problem, make a almond or rice milk-based smoothie and for some extra protein put in a few spoonfuls of nut butter, or protein powder in, along with frozen or fresh fruits (most kids can’t taste the protein powder if its blended well). Craving the islands? Coconut water, pineapple, a bit of protein powder and bananas (with a touch of agave nectar) is my favorite. Share your family’s frozen favorites below! Friends, we are so excited to be apart of Dr.Lynne Kenney and Wendy Young’s #StressLessSummer series and their new book Bloom! 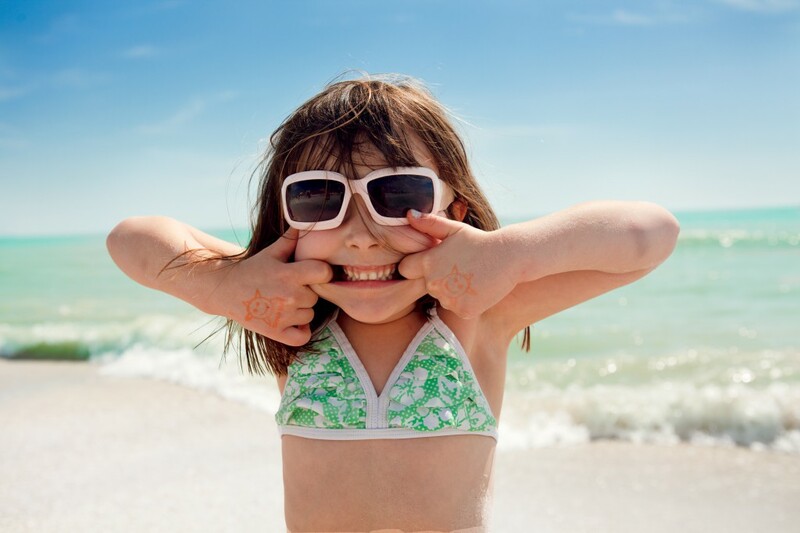 We will be posting their beyond as part of our international #StresslessSummer series with these awesome resources @happysuperfoods, @kellycairns, @sueatkins, @kidlutions, @nutritionistjan, @littlejots, @positivfamilies, @braininsights, @thespicyrd, @mommyperks and more…Each week look for new posts and follow them on Twitter, Facebook, and Pintrest! 1. Create a carefree free attitude. I mean really, why are we still rushing? Take the time to slow down, talk more slowly, walk more slowly and just be plain silly this summer. Summer is made for fun and exploration. So ditch the treadmill and feel carefree:). 2. Stay on a bit of schedule. It will help you get back to school with greater ease. Your home does not have to be totally schedule-free. You can still say up and at-em before noon. If you have teens let em sleep in a touch then make breakfast with them when they get up and going. 3. Find the time to exercise. We added morning family bike rides to our schedule and it helped us to bond, exercise and get those happy hormones going. 4. Eat all the fresh food you can. Berries, greens and local produce will add a spring to your step. 5. Get your sleep. Get to bed at a reasonable hour most evenings. Sleep matters tons in reducing stress. 6. Take a nap. Naps are really great for brain calming, so climb under those covers guilt-free. 7. Play outside. Rain or shine, getting out of doors is a sure way to enjoy the summer hours. 8. Delegate. There is no reason for you to have to wash every dish and do every single load of laundry. Summer is a great time to teach the kids new skills! Bloom: Helping Children Blossom is the newest book written by Wendy Young and Lynne Kenney, for more visit www.kidlutions.com and www.lynnekenney.com. Together, we can help children blossom.